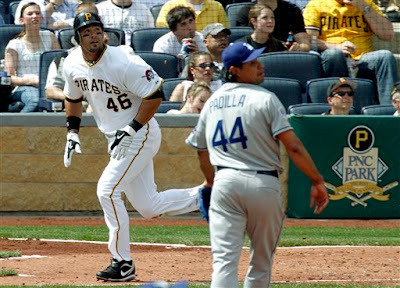 Garrett Freakin' Jones hit two home runs, his first bouncing into the Allegheny River, helping the Bucs beat the Dodgers 11-5. The Legend became the sixth player in Pirates history to homer twice on opening day. Ryan Church hit a pinch-hit three-run double and Ryan Doumit had a three run homer for Pittsburgh. Zach Duke gave up 2 runs in only five innings for the win. The Good things: Garrett Jones. There's a lot of talk about how the Pirates will score runs this year. Hopefully Jones and company can put that to rest. GFJ also had two spectacular catches in the field. Ryan Church. Welcome to Pittsburgh. Andrew McCutchen. 1-4 with a double and a stolen base. The double was close to being a home run. Octavio Dotel. Pitched a perfect 9th in a non-save situation but was fun to watch. The arm strength looked fine and he looks like a big upgrade from the closers role last year. The bad things: The bullpen. D.J. Carrasco and Evan Meek made things a bit uneasy with a big lead. It's the first game so we'll wait and see. Andy LaRoche. Was 0-3 while stranding four runners on base. That's just about it for the bad things. You got to love opening day. We all know the Bucs aren't going to contend this year but wins like this gives the fans hope, plus this team is going to be fun to watch. The Pirates are off tomorrow (good thing because Pens v. Caps is on) and will be back at PNC Park on Wednesday. Go Bucs!